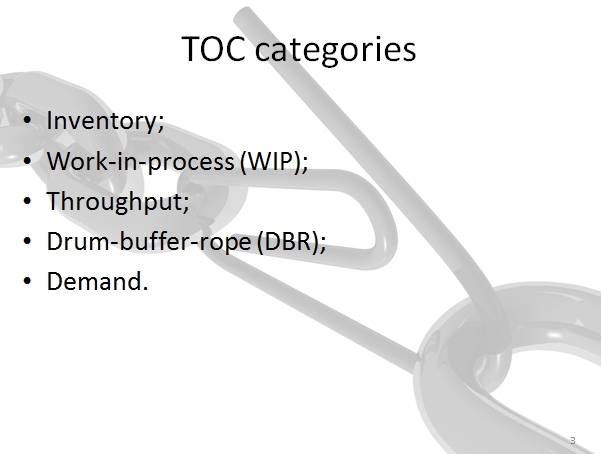 TOC deals with demand, inventory, expenses, throughput, drum-buffer-rope issues. Despite the fact that I am not a professional manager, I intend to show things from the lawyer’s point of view rather than from the managerial point of view. 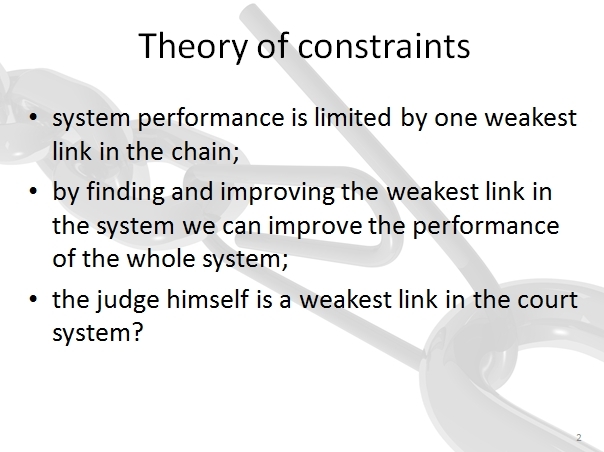 That’s why I don’t stick strictly to TOC terminology and will use it as rarely as possible. I believe that the principles of TOC which I’m going to discuss here may not be applied straightforwardly as this has to deal with common industry sectors. We need a different approach. Here is a short content of my presentation. (3) thirdly, we are trying to discover the starting point. 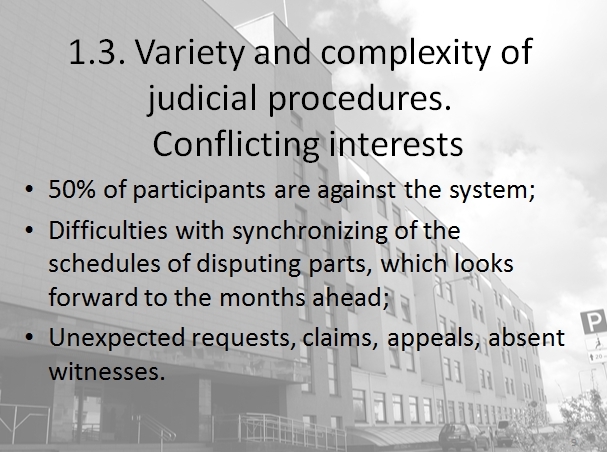 I mean the most common attributes of the different judicial procedures in different countries and legal systems. 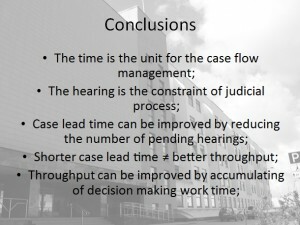 (5) moreover, I am sharing some ideas with you on the case throughput improvement, mainly by employing time previously allocated for postponed court hearings. (6) and finally I’m concluding briefly, i.e., the way I see the above mentioned issues myself. 1.5. Dissatisfaction of the public as an outcome of it all. 1. 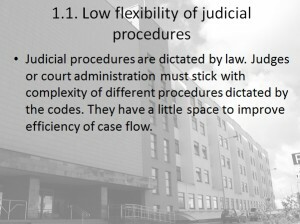 Low flexibility of judicial procedures. Judicial procedures are dictated by law. 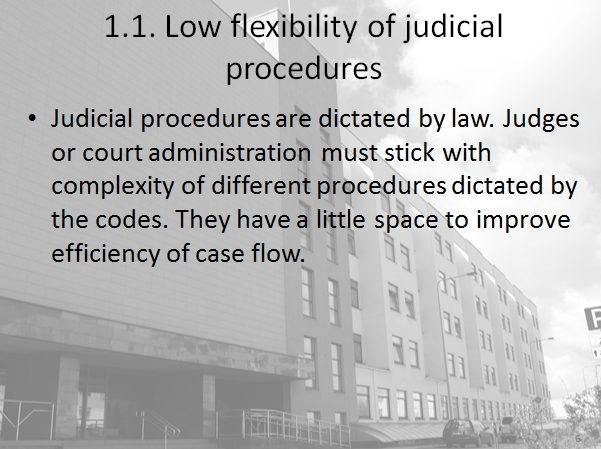 Judges or court administration must stick to complexity of different procedures, which are dictated by the codes. They have a little space to improve efficiency of case flow. For example, by managing case maturing time, case start up time, work-in-progress cases. Furthermore, lawmakers believe that the simplest way to increase a throughput of finished cases is to increase a number of WIP cases and invent even more and more new terms of different intermediate procedures within running processes. Various types of intermediate deadlines overrunning Lithuanian codes. Like one’s dictating pre-trial procedures terms, intervals between hearings in the same case or decision making terms after the hearing was finished. These overrunning terms concentrate on isolated procedures. Unfortunately a judge himself has little to do as long as the rhythm of his job is dictated by these overrunning terms. Judges are independent. 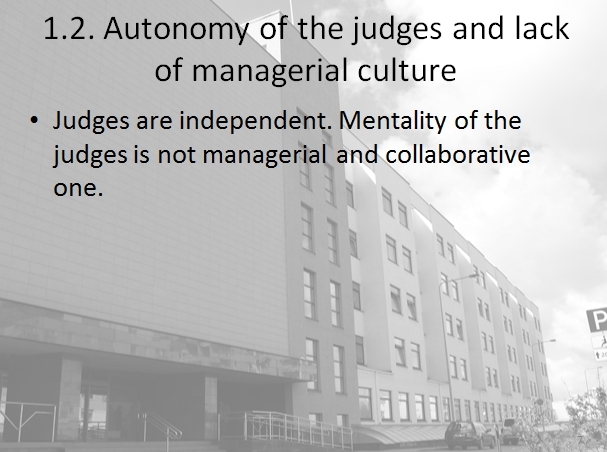 Mentality of the judges is not managerial and collaborative one. 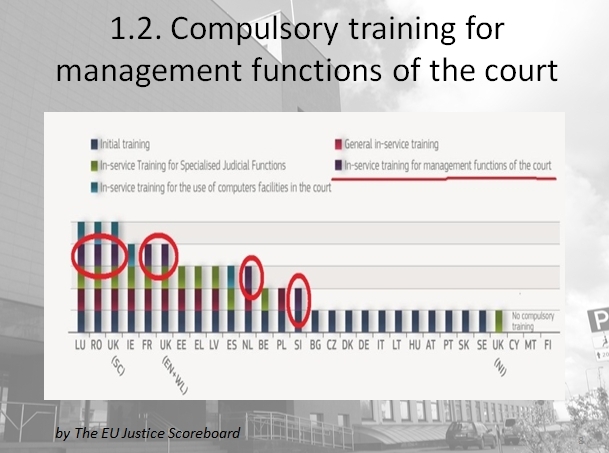 Very few countries provide the judges with compulsory training related to management functions of the court. A judge acts as one separated unit at the court. Making decisions of his own activity, planning everything by himself, not consulting with anybody. That’s why the judge himself becomes a factor of unpredictability. That appears to be a problem especially in the big courts, where court administration must efficiently coordinate the other resources of the court. Such as judges aides, secretaries of the hearing, distribution of courtrooms. To make clear what the problem is, let me put you through a small example of my own practice. I always wondered how it could happen that 100 judges of our court share 50 court rooms and we are constantly struggling with the lack of the courtrooms while hearings take less of the judges’ time than different kinds of paperwork in the judges’ own office. I share the courtroom with one of my colleagues and offered him once to share a hearing time rather than the courtroom itself. I meant to have hearings on Tuesdays and Thursdays while my counterpart would use the courtroom on the rest of workdays. The answer was very short: “You get hearings whenever you want and I get hearings whenever I want”. That was the end of my courtroom sharing deal. And let’s realize now that you do not have to find consensus with two judges, but with a hundred ones. So we have here consensus and collaboration issue, which is not as simple as it looks. Differences of various criminal procedures may vary from one country to another, but the fact is that there is still a great number of them in any taken country. Handling of such a variety of different rules is a challenge for every judge and court management. It is necessary to extract some common laws, some starting points for managing of this all variety. That’s where TOC approach is helpful I believe. Mr. S.Pass pointed out that 50% of participants are against the system, but this is not the end of the story. Full-kit issue is well known in the TOC. It means that you can’t start the hearing as long as a “complete kit” of litigants, witnesses is present in the courtroom. Almost each of them- attorneys, prosecutors, experts have their own due dates, schedules in the other judicial proceedings. These schedules look forward for months . It is difficult to find a room for a hearing in acceptable terms, which is appropriate for everybody. I am not speaking about other issues such as unexpected illnesses of some key process part, sudden requests of different kinds, appeals and so on. 5. As a consequence of it all– relatively long lead times, growing distrust and dissatisfaction of the public. Yes. Long case lead time sometimes is a problem and we are discussing it, but what I would like to stress is that there is the other side of the story too. Courts have little to do without legislative support, which is up to lawmakers not to the courts’ authorities. So the issue is not only addressed to the courts, but also and mostly to politicians. 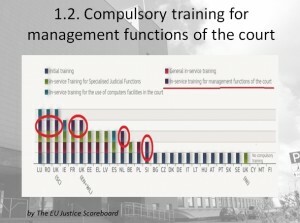 Recently the EC (YSY) Directorate -general for justice unveiled “The EU justice scoreboard” which on the regular basis will cover some basic statistical numbers about efficiency of the courts in member countries. 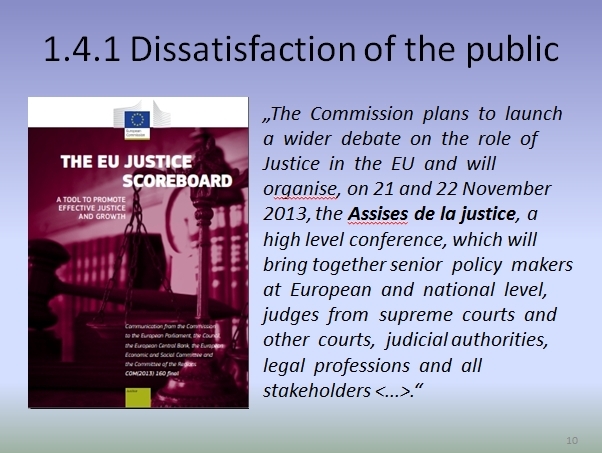 High profile conference on the issue of efficiency of the court management will be hosted by the EC soon. I’m looking forward to the conference. I hope some realistic starting points will be found. 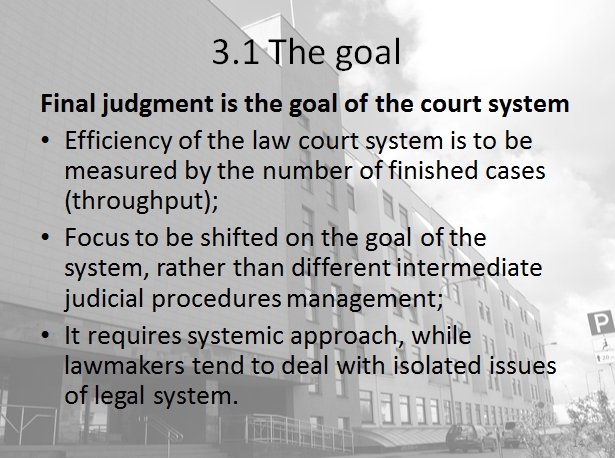 Anyway, the good news is that policymakers realize the necessity of the efficient court management. And now. I am digressing a little bit, but let me say a few words about an issue of public perception of judicial procedures as well as public relations of the courts. 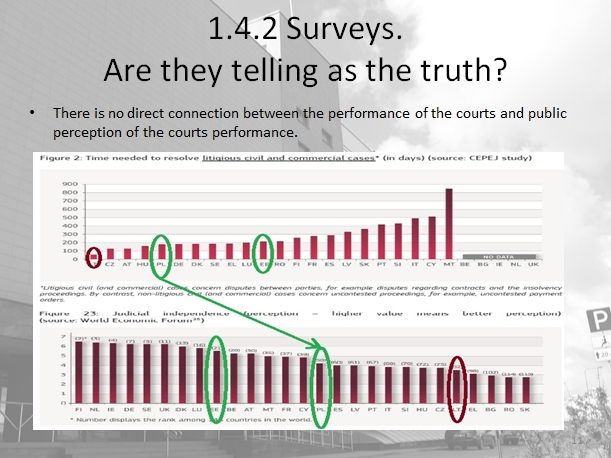 Looks like in the survey, the issue of public perception of the courts is directly connected with a length of judicial proceedings. I want to disagree with this opinion. 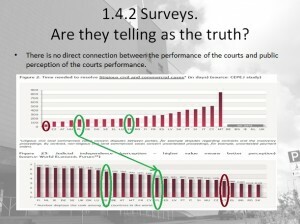 There is no direct connection between short case lead time for example and positive public perception of the courts’ activity. As we see on the screen, the number of long leading cases in Lithuania is relatively small. While the public distrust of judicial system is still quite high. And on the other hand, in the countries where judicial proceedings lead relatively longer, positive public perception of the courts is relatively better. I think that not the last reason for that is poor public relations of the courts as well as offensive rhetoric of some populist policymakers. Next. I believe that this is because only a small part of pending cases becomes a subject of public interest. These are namely those vicious, long leading, complicated cases of high profile. Therefore the picture of the courts’ activity which is seen in public is incomplete. As it is formed by a small fraction of all pending cases. 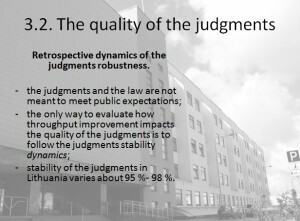 Finally, only a small part (about 10% of the population of Lithuania) has personal experience of participating in any sorts of judicial proceedings. 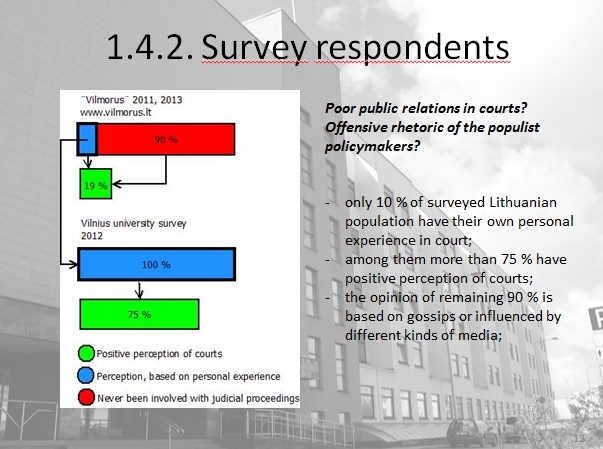 While the research of Vilnius University provides us with completely different statistics of public opinion. This research covers only the opinion of respondents, who were involved in judicial proceedings and have their own personal experience based on direct participation. The above mentioned research reveals that over 75 % of the interviewed litigants, witnesses and other participants are confident of the court independence. Therefore I believe that public perception of the courts’ activities is not the only matter of the court management, but courts public relations as well. 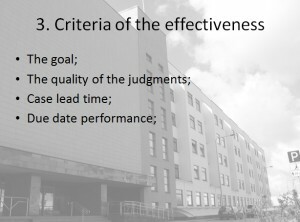 Before speaking about criteria of effectiveness we will describe a goal of the system. Whether it is a plant or office, the goal of both industries is to increase their profit by means of the sales. Namely by the sales, but not by manufacturing itself. As to the courts, the purpose of their existence, of course, is not to make profit. Courts are providing a public service by issuing final rulings. The demand for this kind of production is virtually unlimited as we know. That is why the courts have no problems with “sales” and “demand”. The public in general does not care about how long different intermediate judicial procedures will last. The public is concerned about the final result. I mean it cares about how fast a very final judgment of good quality will be issued. 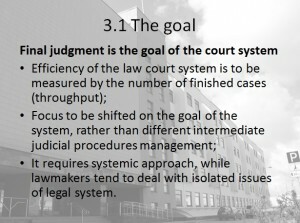 That’s why the management of the courts must focus on its main goal- increasing a throughput of the judgments of good quality rather than focusing on different kinds of intermediate terms and intermediate procedures. Clearly speaking, the judge has to maintain all his cases to be leaded in acceptable terms. Rather than taking care of some single isolated case and leaving aside the rest of his cases. The judge must distribute his time resources equally for all pending cases. Therefore defining the goal more precisely- it is to issue as many as possible rulings of good quality in acceptable terms. That is what throughput in TOC is about. 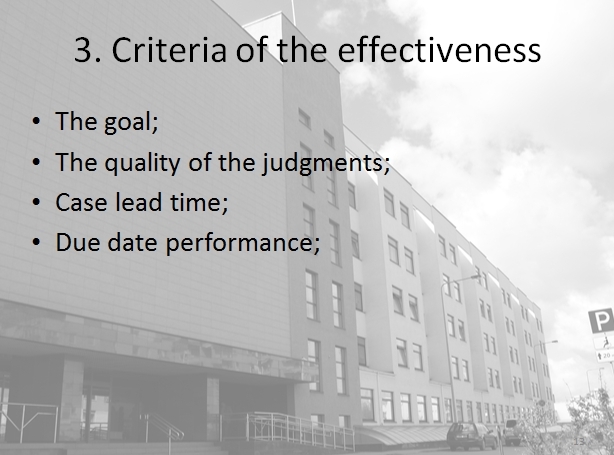 And now a few words about criteria of effectiveness. As I have mentioned before, a quality of the judgment is essential too. Most of my colleagues may agree with me that there is no clear measure for this sort of criteria. The quality of the judgment can neither be measured by time nor by money. Of course, such criteria can’t be for example, that judgment has to meet a kind of public expectations, any sort of political issues. The judgments and the law are not meant to meet public opinion or to satisfy public. The quality of the judgment must be measured within the same system. I can say in advance that I don’t like this criterion which I am going to introduce here either. But as long as we don’t have anything better, the one and only criteria for the quality of the ruling is the stability of the rulings. The 1 instance court ruling has to be approved only by the dispute parts by letting the judgment to come into force, or by appealing before the court of appellate instance. Then the decision of appellate instance court will measure the quality of the previous decision. Of course, this criterion is not perfect, because the grounds of the repealed judgments are not necessarily related to interpretation and application of laws. But we don’t even need static and absolute stability numbers. What we need is the effect of increasing throughput on the dynamic of stability of the judgments. Just to compare the numbers of stability before some actions of managing have been taken and after. 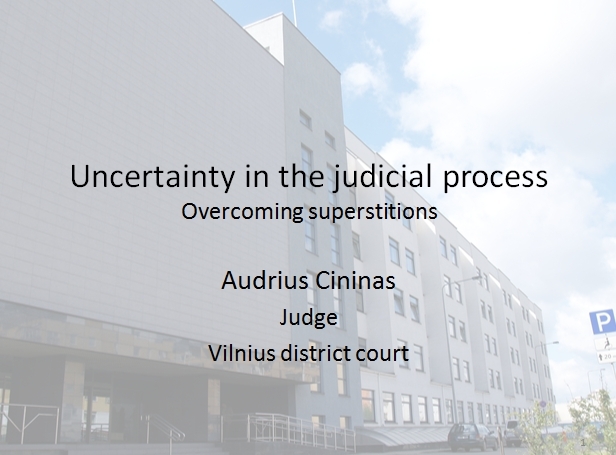 Stability of rulings of Lithuanian courts looks fair. 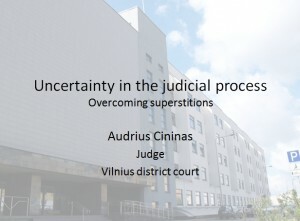 About 95- 98 % of decisions of the 1 st instance courts of Lithuania remain unchanged by the court of the appellate instance or come into force without appeals. Less than 10% decisions of the 1 st instance courts were appealed in 2012. This means that disputing parts admit decisions of the courts on the very first level. Case lead time is a source of public disappointment too. 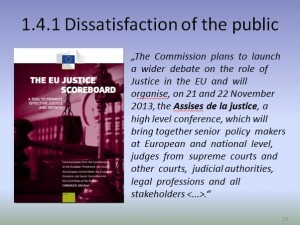 We all know the notorious expression justice delayed is justice denied; 2013 EU justice Scoreboard gives us some numbers on the length of the proceedings in all EU countries. As we see on the screen, case lead time may vary significantly from one country to another. 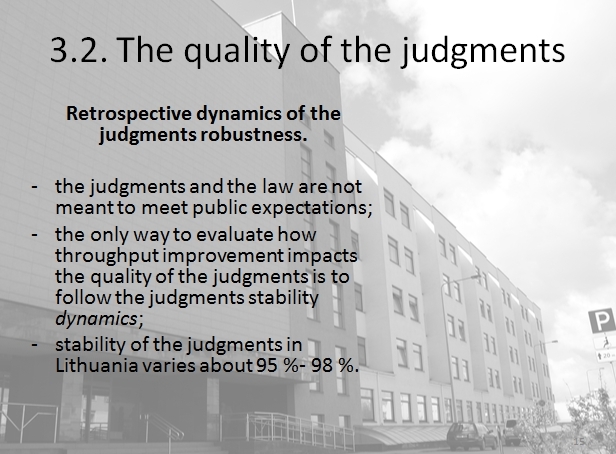 Even in Lithuania, where statistics looks more than good, the length of the proceedings may vary. 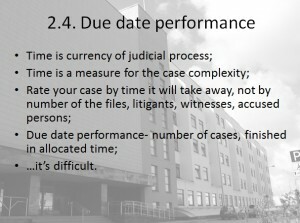 The length of proceedings in litigious cases is far above the numbers, which is shown in the picture. This average numbers, I believe, include a large number of judgments in small claims, where the process is run without hearing the case in a courtroom. An average length of the criminal proceedings in Lithuania is similar to civil cases and varies around 100 days. This does not mean of course, that there are no long leading criminal processes. About 4% of criminal cases in Lithuania lead more than 1 year and some high profile mega cases, which involve high profile politicians lead for years. That is not because of sluggish judicial procedures, but because of large numbers of witnesses, numbers of claims, sophisticated defense tactics. 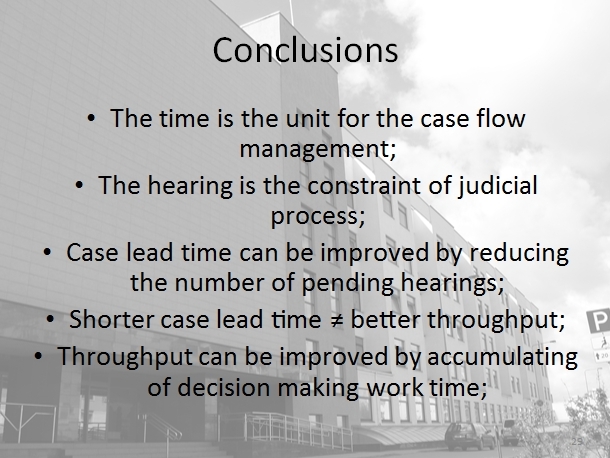 In the end, what I would like to emphasize while speaking about the case lead time is, that not necessary improvement of case lead time improves the throughput of the cases. I would like us to keep in mind that better case lead time is not equal to better throughput. TOC does not operate with raw materials or commodities but it also operates with universal units and it is related to money and time. In judiciary it means that every case must be finished in terms, which were allocated for that particular case. 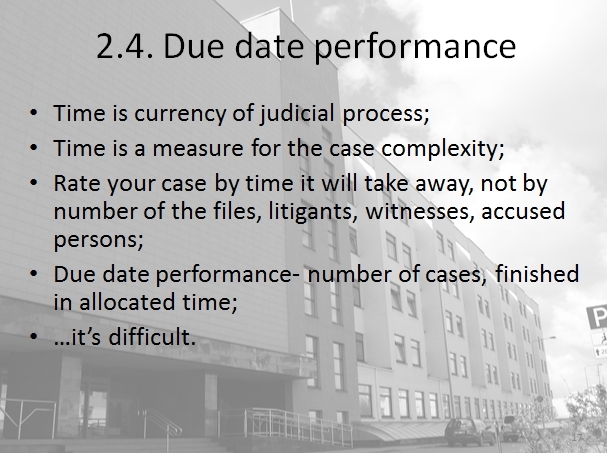 Due date performance does not only include planning of the lead time but it also includes a planning of the number of hearings and time, allocated for each hearing in the courtroom. The time is the universal measure for the case, so that the complexity of the case must not be measured by the number of litigants, witnesses, by the number of the files or number of accused people, but namely by time. The time embraces all the factors universally. Of course you may say, it is a little tricky thing to evaluate the case this way. But it is the matter of the judge’s experience. I believe every judge must develop this ability. I mean not to look at the case like a set of the files, but evaluate it as a unit, which will consume a certain part of the judges’ work time. And now where is that special point we should start with? As I have already mentioned, a virtually infinitive number of different judicial procedures in the different courts of different countries are running now. The manufacturing in the court has a shape of the letter “I”. It is the simplest straight forward manufacturing way of all. It means that cases are produced on the simple production line. From the very beginning to the end. You take the case, put it at the beginning of the production line, make necessary manipulations, stop the line when something unexpected happens and run the process again later until the end of the line. Then you take the next case and put it on the empty line again. That’s simple. But the problem is that the judges are multitaskers. They do not deal with a single, but tens and even hundreds of production lines simultaneously. The human can’t work on two or more lines simultaneously. While one particular line works, the rest of them have to be halted, waiting for the time to start for each of them. And that is not the end of the story, by the law of Murphy the one or more lines will start working without notice at that particular time, when the judge is busy with manufacturing of some most complicated case he has of all his cases. Is it possible to deal with it? 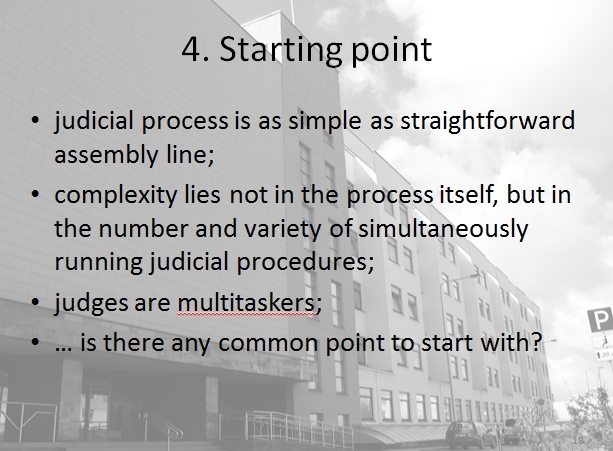 What are the most common attributes of the judicial proceedings to start with? 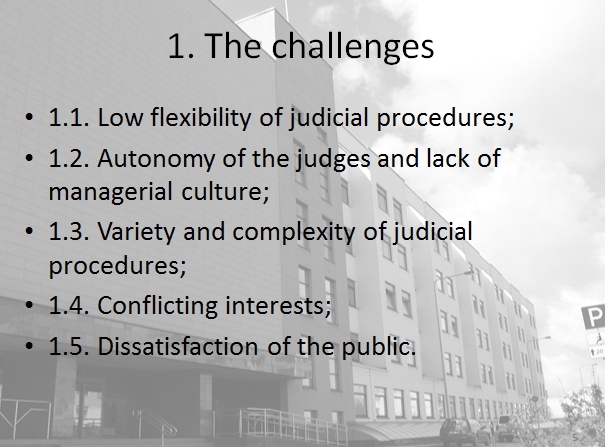 Despite of great variety of judicial proceedings, most of them have common attributes, which are universal almost in all countries and all types of judicial proceedings. 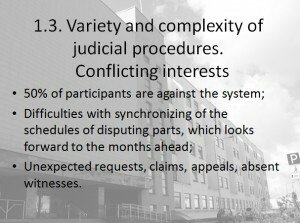 Common judicial proceedings consist of three main stages. They are pre-trial proceedings, hearings, held before a court and decision making. You may agree with me that the most time consuming, most unpredictable and most difficult to manage is the second stage of the judicial procedures which is public hearings. Using TOC terminology, we can suppose that the first stage of the proceedings is a sort of inventory. Here the cases mature, which are not in process yet. The cases are waiting for the appropriate time to start up. The judge himself can control the speed and number of the cases, flowing from “inventory” to the second stage; let’s call it work in process (WIP) stage. This is important, because the number of WIP cases effect the case lead time. 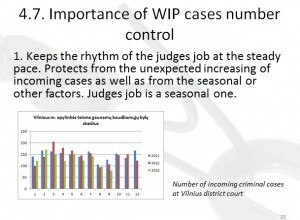 The more WIP cases the judge operates, the longer the lead time of each case is. Let’s take a small abstract example. Let’s suppose, that some judge got 100 cases that need to be heard. Each of the case requires 3 meetings and each of the meetings is 2 hours long. In TOC terms, the judge got the work which would take about 600 working hours. That is our inventory. We can use two strategies for distributing the working time. Let’s name them. 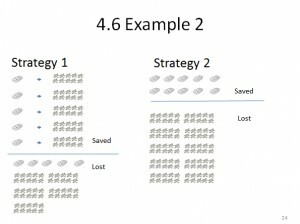 The Strategy 1 and the Strategy 2. The Strategy 2 does not know anything about the TOC and assumes that the early start of the hearings in all cases means a quick finish. The Strategy 1 knows a bit about TOC and implies distributing of the cases into five small fractions. 20 cases each. The size of the fraction is not limited here by the judge, but by some external constraint which prevents from setting up WIP in even smaller fractions and shorter intervals between hearings. Assuming, that working day of the judge is 8 hours long. The Strategy 2 supposes to held the first meetings in all 100 cases consequently, then the second hearings in all 100 cases and the final meeting again in all 100 cases. The Strategy 1 as we already know, is to divide the cases into small fractions and deal with them, keeping the rest of the cases as inventory. I would not bother you with calculations, which is quite simple by the way. Just let’s take a look at the results of the average lead time. 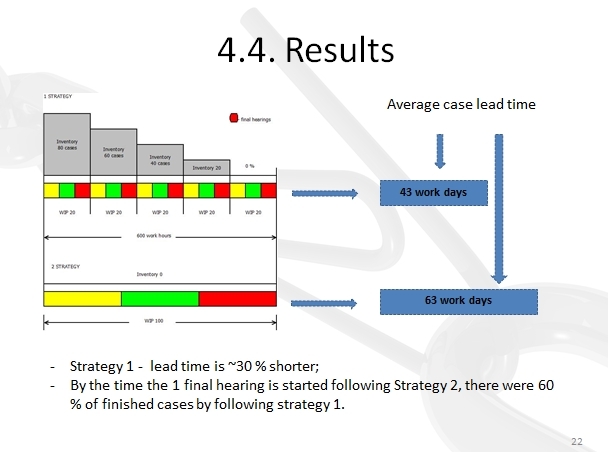 What we see here is that the average lead time of the cases following the Strategy 1 is much shorter. Final meetings in each of the fraction of the cases are marked with the red color. We see here that following the Strategy 1 60% of cases by the first final hearing were finished when the Stategy 2 was started. It means that at least 60% of the Strategy 1 litigants are happier about the case leading time than the Strategy 2 litigants. It looks a little confusing that only a distributing of the time can change a case lead time so significantly, but it is. 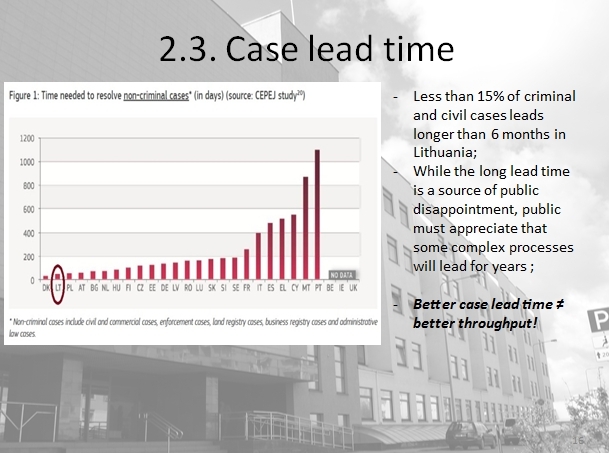 Again I would like to remind you that increasing of case lead time in long time frame does not affect the throughput. 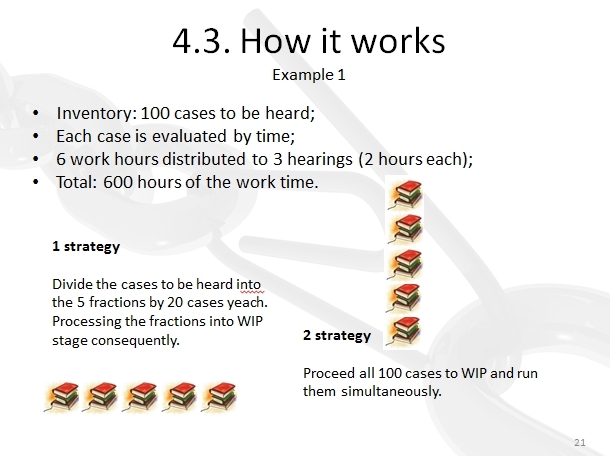 As we see in our example, throughput of the cases in a time frame of 600 working hours is 100 cases no matter which strategy was used. If it still looks confusing, let me put you through another yet example, which reveals the differences of the strategy of the judges without any complicated calculations. I’ll excuse to you in advance for such a simple school example. Let’s take a sinking ship. In 30 minutes the ship will dive under the sea completely. There are 100 passengers on board, 10 life boats for 10 passengers. 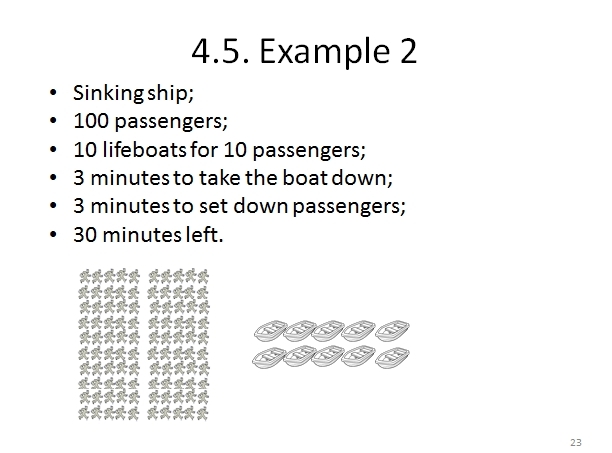 It takes 3 minutes to take down each boat and 3 minutes to set down 10 passengers into the lifeboat. The Strategy 1 is to take down the lifeboat and set down the passengers immediately. The Strategy 2 is to take down all life boats first. And the results of these two different actions are shown on the screen. 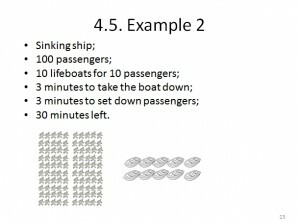 By using the Strategy 1 fifty passengers of the ship were saved by the time the ship sank down. By using the Strategy 2 none of the passengers survived, because all the time was wasted for lifeboats saving. So we see from the two examples that at least fifty passengers of the Strategy 1 were happier than all the passengers of the Strategy 2. This example also demonstrates us my previous notifications that in a sufficiently long period of the time, the distribution of time will not increase a throughput of the cases. As we calculate from above examples in a period of the 600 working hours in the first example or in 60 minutes in the last example all cases will be finished and all passengers will be saved. That’s no matter which strategy will be used. Then the question arises – why the distribution of the time is so important? Firstly, it helps to set a rhythm of the judge’s job. Rhythm of the manufacturing is the famous issue in TOC. Neither judge nor court administration can control a number of incoming cases, that is a factor of uncertainty. You may be surprised, but the number of incoming cases in the court is the seasonal one. It varies more than 100% from one month to another. 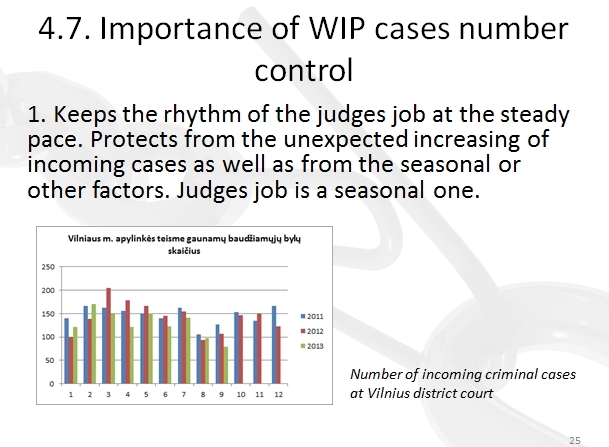 This is the numbers of incoming litigious criminal cases at Vilnius district court. Number of incoming cases swings from less than 100 cases to more than 200 cases in a month. It gets really impossible to keep steady pace of work without managing of the inventory of the cases by storing the cases for some time as inventory in the pre-trial stage. Until the better times will come. 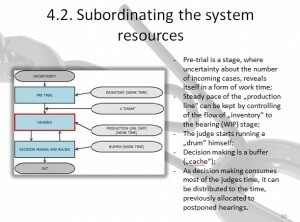 By controlling time, occupied by WIP cases, a judge dictates the rhythm of the production himself instead of letting to set it by unpredictable “judicial market”. In other words, the judge himself controls the drum. 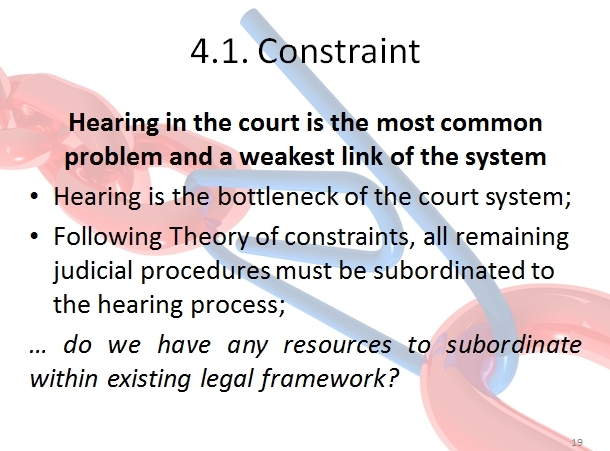 That is important, because while being a constraint of the judicial system, a judge sets the rythm himself, not to be overloaded by a number of incoming cases. 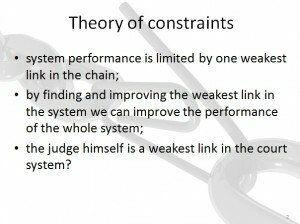 That is precisely what is recommended by TOC- to keep work at the pace of the constraint. On the other hand, not much like in the common industry sectors, size of the storage and the number of maturing in pre trial stage cases cost virtually nothing, as the court as we know may not worry about demand swinging and suppliers. Length of the intervals between the meetings in the same WIP case. We all know, the longer the interval is, the more you forget about the particular case. The more you forget, the more time you have to spend by restoring the circumstances of that case. A human can keep focus on the case for a time of several months if anything is moving up there. I am not speaking about the other shortcomings, such as unacceptable long lead time, and probability, that some of the witnesses may simply forget that they were summoned to the court as witnesses. Anything unexpected can happen in a long break time. 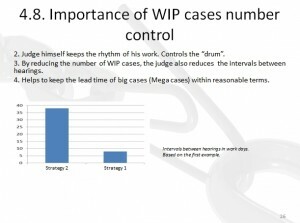 This is a picture, based on our previous example, how the number of WIP cases affects the length of the interval between the hearings. 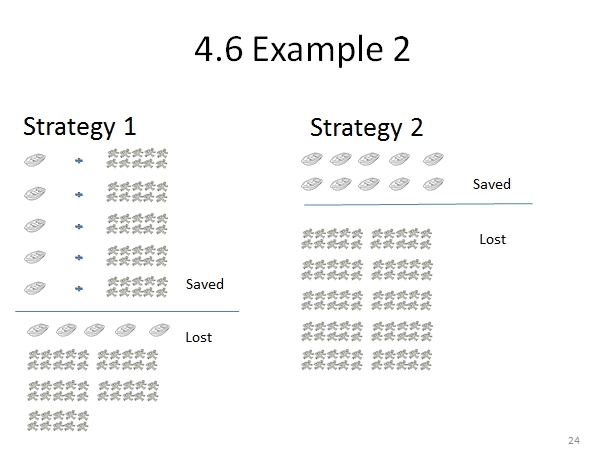 We see here that the interval time in the Strategy 1 and the Strategy 2 differs dramatically. 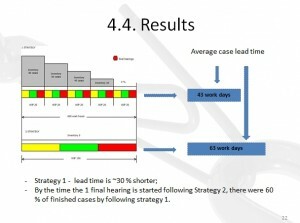 The interval time following the Strategy 2 is as long as about 40 working days, while the intervals between the meetings using the Strategy 1 is less than 10 days. There is no doubt, who is happier about the judicial proceedings and the case lead time- litigants of the Strategy 1 or the Strategy 2. So my recommendation is here. 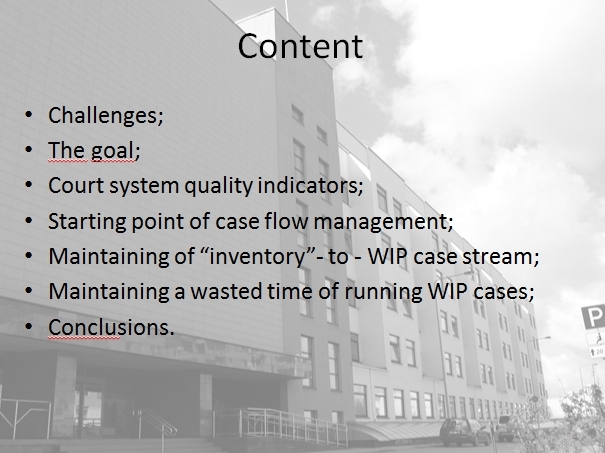 Once the case started WIP procedures, it is necessary to keep it hot until the very end of the WIP process. 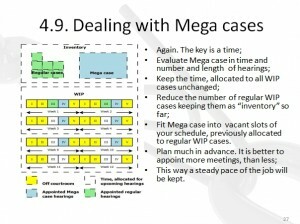 It is impossible, if you maintain too large number of WIP cases at the same time. No secret that big cases consume a lot of judges’ time. The question is how to fit a big case into the routine of regular cases exchange. The big cases do not require 2 or 3 meetings, as it is with regular cases, but they require ten or more. 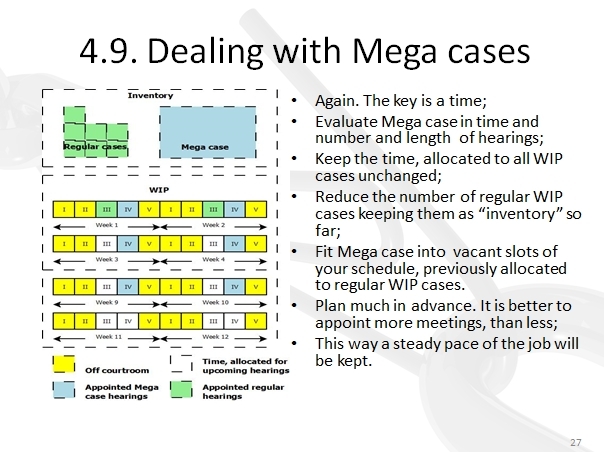 And the question is how to match the hearings of mega cases with the meetings in the regular cases. I believe it is possible, by using the Strategy 1 of small fractions of running WIP cases. And by evaluating pending jobs with units of the time, instead of some another units like number of the cases or the number of the files within the cases. Suppose, we got a big criminal case, which will take as we have evaluated in advance about 80 hours of WIP time. These are 10 meetings, 8 hours long each. As we keep as little as about 32 working hours of WIP cases or two working weeks. We are able to appoint the first meeting in two weeks, which as we understand is unrealistic in mega cases. Because the constraint here is not a judge, but some external constraint out of the judicial system. It is obvious that there is a big number of disputing parts in the big cases. Legal representatives have already been appointed to the hearings in the other trials. There is simply no room for another yet meeting in such a short period of the time. Unlike the regular cases, the hearing dates for the big cases have to be scheduled much in advance. And the time not for one, but for all planned meetings has to be allocated in the schedule. In our example the time for 10 meetings has to be allocated in advance on the weekly basis. My own schedule for a big case should look like one showed on the screen. Hearing of the criminal cases on the daily basis is unrealistic in Lithuania. As various claims, intermediate appeals from disputing parts can occur and it takes time to solve them as well as find possible new evidences or find missing witnesses. Therefore in my opinion hearing of the big criminal cases on weekly or even two week basis is most appropriate for Lithuanian legal system. As you have noticed – Mondays, Thursdays, Fridays are always empty in my schedule, that’s because the meetings are only a part of judges’ activity and these three days have to be allocated for another purposes. The empty Tuesdays by the time coming will be filled with another regular cases from the ‘”inventory” which are still waiting in the pretrial stage. Now let’s take a look at the previous picture again. 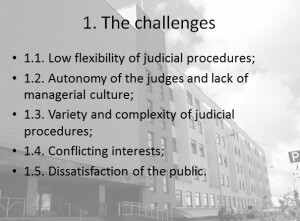 The last stage of the judicial process is the decision making stage. This stage is supposed to work as a buffer for reducing of wasted time in previous WIP stage. This is the way to increase throughput of the cases. On the grounds of my own experiences I found out that decision making and the ruling take at least half of the judges working time. This working time off courtroom can be effectively used as a buffer. This paperwork time can be used for filling of the time, which was previously allocated for postponed hearings. Because there is no need for any special preparations or appointments for judges off courtroom job. The idea of creating such a buffer looks confusing a little, because we are used to thinking that the judge goes away for decision making immediately after the final hearing is finished. 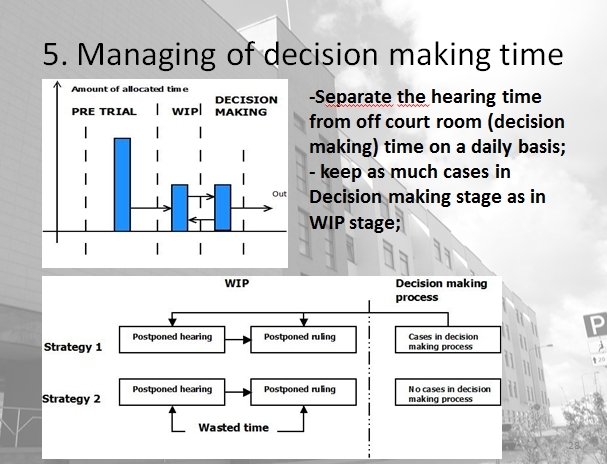 We are used to thinking that the time for decision making is necessary allocated next to the planned final hearing. This is not correct. Very often judges have subsequent hearings one day and then the other day for the decision making in a number of finished cases (not in the special one). This is because we never know for sure about the date of very final hearing. The strategy of immediate decision making generates a lot of wasted time. Suppose we have postponed a hearing and no off courtroom job. In this case the time is not wasted for the postponed meeting alone, but also the time allocated for immediate decision making. This is because I believe that hearing time and time for paperwork out of courtroom have to be strictly separated. At least, on a daily basis. The time, dedicated for decision making has to be preserved by time for buffering purposes. I mean for filling the time of the postponed hearing. It is necessary to accumulate sufficient amount of decision making time to fill not only the days intentionally allocated for decision making, but also for buffering purposes. 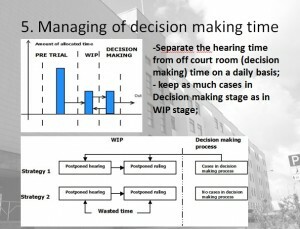 In my opinion, working time, accumulated in decision making stage has to be nearly equal to that allocated to WIP cases. And finally my brief conclusions. Džiaugiuosi, tad teisinėje sferoje atsiranda mėginimų pritaikyti šiuolaikines vadybos teorijas. Vis tik galvoju, kad sausos teorijos ir skaičiavimas nėra pakankami pokyčiams. Formaliai žiūrinti, oficialūs rodikliai nėra blogi – berods galima sakyti, kad telpa į tris sigma – tačiau siekiamybė turėtų būti 6 sigma. Visk tik visuomenės pasitikėjimo klausimo reikėtų ieškoti kažkur kitur – spėčiau, pagrindinė problema – teisingumas nėra pakankamai visiems vienodas, t.y. temindė nėra akla. Siekiant proceso efekyvinimo turėtų padėti bylų rūšiavimas pagal sudėtingumą – nesudėtingus darbus reikėtų “outsourcinti” ar kitaip pavesti žemesnės kvalifikacijos darbuotojams, arba automatizuoti.